William Hall originated from Scotland. William Hall was, according to his own account, born in the Scottish county of Roxburghshire around 1826. [ In the 1891 census, William Hall gives his place of birth as Selkirk, a Scottish town located in a neighbouring county ]. When he was in his twenties, William Hall moved to England, where, around 1853, he married his wife Eliza (born c1826, Portsmouth, Hampshire). The couple settled in the Sussex seaside resort of Brighton, where, during the 4th Quarter of 1854, their first child, Eliza, was born. Mssrs GREY and HALL beg to announce that they have just opened the above establishment and have completed arrangements for taking Portraits by all the most recent and improved processes, by License of the Patentees. Talbotype Portrait of large size, mounted in gilt frame, 15s. mounted duplicates 7s 6d. Coloured Collodion Positives by a new and peculiar process from 15s. Daguerreotype, warranted to last, from 6s. These pictures are taken in a spacious Glassroom, erected for the purpose, in which is obtained the most agreeable light and shade. Grey & Hall's General Photographic Institution was unusual in that the photographers offered to take portraits using all three of the available photographic processes. - Daguerreotype, Talbotype and Collodion Positive. The patent on the daguerreotype, a positive image on a silver-coated copper plate, had come to an end on 14th August, 1853, and so, strictly speaking, Grey & Hall did not need to hold a licence for this particular method of photography. 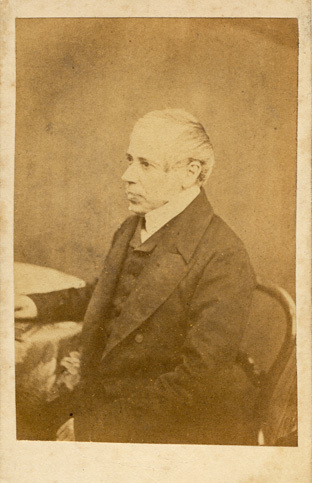 The Talbotype was a positive print on paper made from a negative using William Henry Fox Talbot's calotype process, which the inventor had patented in 1841. Professional photographers who wished to produce Talbotype portraits were required to purchase a licence from William Henry Fox Talbot. In 1851, Frederick Scott Archer had invented a photographic process which involved coating a glass plate with a sticky substance called collodion. Archer had chosen not to patent his invention, but as the collodion process involved making photographs from a negative, Talbot claimed that the process was covered by his earlier patent. The Collodion Positive was a method by which an underexposed collodion glass negative was placed against a black background to give the appearance of a positive photograph. 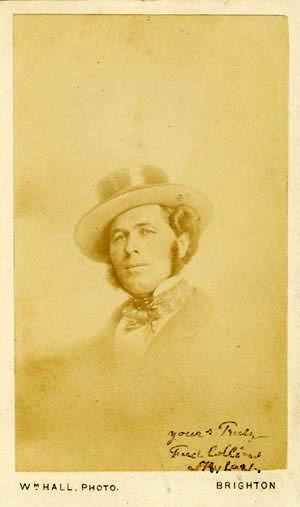 As William Henry Fox Talbot had recently started legal action against photographers who were using the collodion process, alleging they were infringing his patent rights, Grey and Hall decided to purchase a licence from Talbot so that they were free to produce both Talbotype portraits and 'collodion positives.' By 1854, there were only nine photographic studios in England holding licences from William Henry Fox Talbot and two of these were located in Brighton - Hennah & Kent's Talbotype Portrait Gallery at 108 King's Road and Grey & Hall's General Photographic Institution at 13 St James's Street. Grey & Hall's Photographic Institution was located at 13 St James Street, in the eastern part of Brighton called Kemp Town. St James Street led to the Old Steine and ran parallel to Marine Parade on the eastern seafront and so was reasonably well located for visitors to the seaside town. 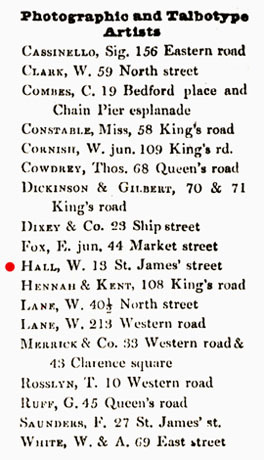 Folthorp's Directory for Brighton, which was compiled in September 1854, lists the business premises of Grey & Hall at 13 St James's Street, but within a month the two photographers had opened a second studio in the Old Steine.In October 1854, Grey & Hall publicized a second studio at 18 Old Steine, but this branch studio was only in business for a short time. The partnership of Grey & Hall was dissolved on 25th November 1858. William Hall retained the studio at 13 St. James's Street and his former partner Stephen Grey established a separate studio of his own. [ABOVE] Advertisement for Grey & Hall's Photographic Institution which mentions two portrait studios in Brighton, one at 13 St. James Street, the other at 18 Old Steine. This advertisement appeared in The Sussex Express on 7th October 1854. During his business association with the photographer Stephen Grey, which lasted for over 4 years, William Hall had fathered two more children. William Hall junior was born in Brighton towards the end of 1856 and his brother James Hall was born in Brighton during the 2nd Quarter of 1858. 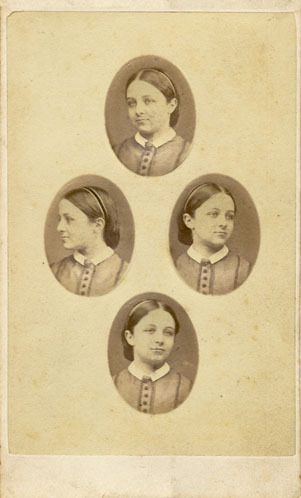 William and Eliza Hall's fourth child, Christiana (or Christina) Hall was born in Brighton during the 4th Quarter of 1859. 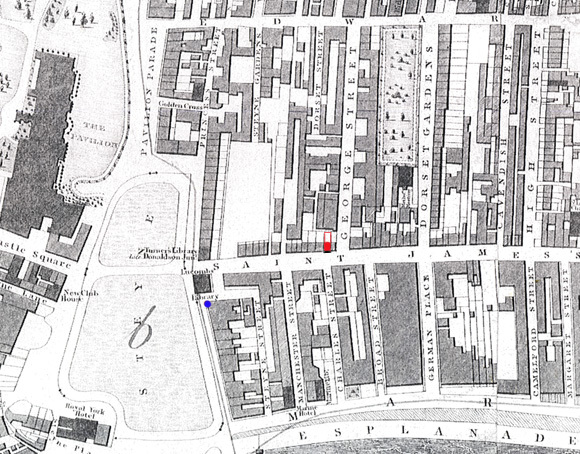 [ABOVE] A detail from an old street map of Brighton showing the location of William Hall's photographic studio at 13 St James's Street, Brighton [ marked in red ]. 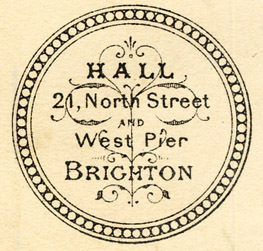 By the end of September 1854, William Hall and his partner Stephen Grey had opened a second photographic studio at 18 Old Steine, Brighton [ marked by a blue dot ]. When the partnership of Grey & Hall was dissolved on 25th November 1858, William Hall retained the photographic studio at 13 St. James's Street. When the census was taken on 7th April 1861, William Hall and his family were recorded in the living quarters attached to his photographic studio at 13 St James's Street, Brighton. [ According to early advertisements, William Hall's studio in St James's Street was a spacious "glass-room"]. On the 1861 census return, William Hall is described as a thirty-four year old "Photographic Artist". The following year, William Hall acquired business premises at 21 North Street, Brighton, a building situated next to Lady Huntingdon's Chapel. The building at 21 North Street had previously been used as a lace and linen warehouse, but Hall successfully converted it into a photographic portrait studio. For a short period, William Hall operated the studios at 13 St James's Street and 21 North Street in tandem, but around 1863, he sold his studio in Kemp Town to the artist and photographer Richard Jeffray. From 1863, William Hall worked solely from his studio at 21 North Street, Brighton. 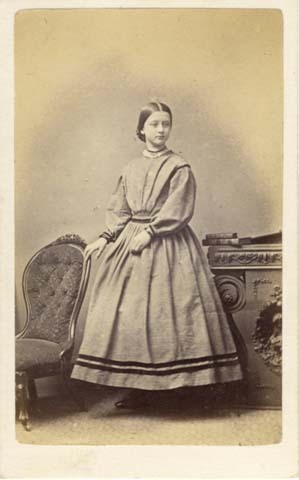 By the early 1860s, William Hall was mainly producing small carte-de-visite portraits at his photographic studio. [See examples from William Hall's St James Street studio below]. 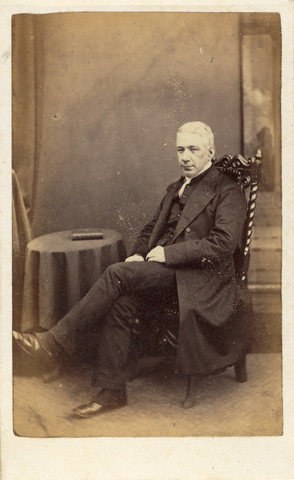 William Hall charged 12 shillings for a dozen carte-de-visite portraits. 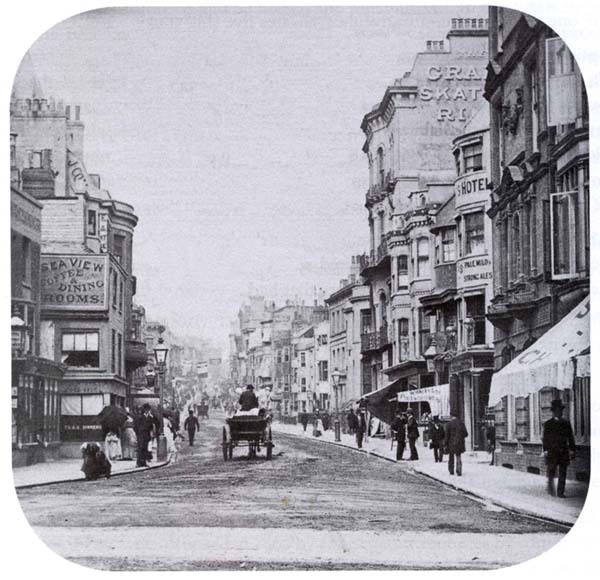 [ABOVE] An old photograph taken in the early 1870s showing the stretch of Brighton's North Street where William Hall had his photographic portrait studio between 1863 and 1874. On the left is John Daniel Wright's shop and warehouse at 19 North Street, Brighton. On the right is 21 North Street, Brighton, which housed William Hall's photographic studio. In between the two businesses is Lady Huntingdon's Chapel, a Methodist place of worship which had been rebuilt between 1870 and 1871. 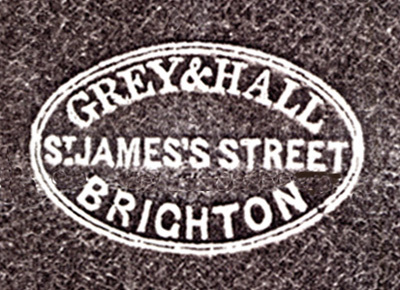 [ABOVE] The trade plate of Grey & Hall of 13 St. James Street, Brighton, which was stamped on the leather case of the collodion positive photograph shown below. 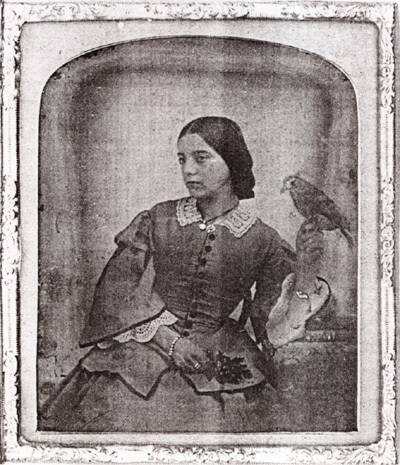 [ABOVE] Portrait of a young woman holding a pet bird, a collodion positive (ambrotype) by Grey & Hall's Photographic Institution, 13 St. James Street, Brighton (c1858). [ABOVE] The trade plate of the photographer William Hall which appeared on the reverse of cartes-de-visite produced between 1862 and 1863 when he was operating two studios in Brighton. In 1862, William Hall, who had worked from 13 St. James's Street since 1854, acquired a second studio at 21 North Street, Brighton. 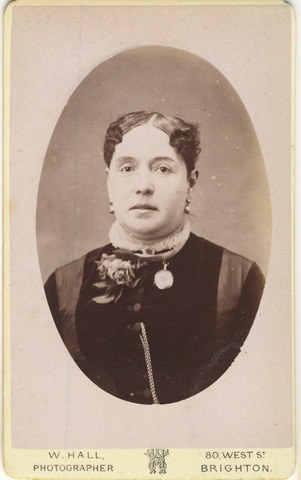 [ABOVE] A collodion positive portrait of an unknown woman dating from around 1860, but re-photographed by William Hall a decade later in order to produce a carte-de-visite copy. [ABOVE] The trade plate of William Hall, photographer of 21 North Street, Brighton (c1865). William Hall operated the studio at 21 North Street for over 10 years, between 1863 and 1874. 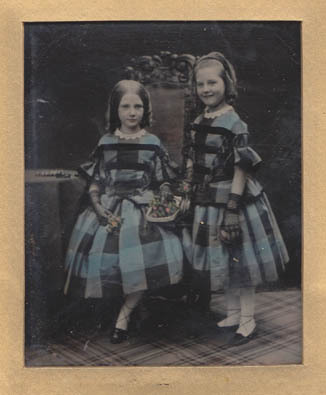 [ABOVE] A framed collodion positive portrait of two identically dressed girls, probably sisters, produced at Grey & Hall's Photographic Institution around 1855. 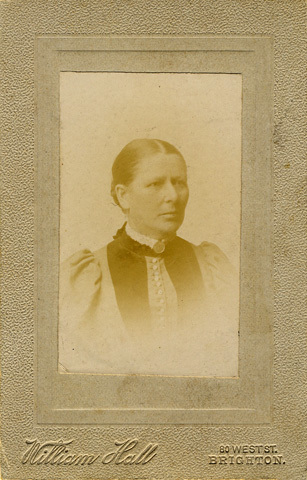 The photographic frame was provided by W. J. Penn, picture frame maker of 12 Grove Road, Eastbourne. 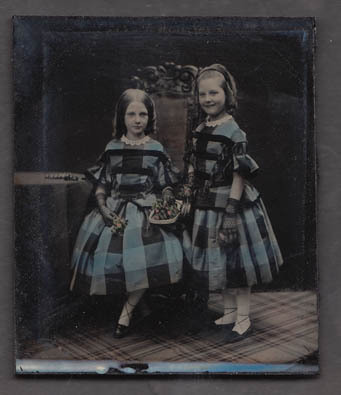 [ABOVE] Grey & Hall's collodion positive portrait depicting two identically dressed girls (c1855). In this picture, the portrait on glass has been removed from its frame. At the back of the photograph on glass is an advertising label for Grey & Hall's Photographic Institution in Brighton. [ABOVE] A fragment of an advertising label advertising Grey & Hall's Photographic Institution at 13 St. James Street and 18 Old Steine, Brighton, which provides the backing to the portrait illustrated on the left. The text states that "Mr. G. & Mr. H respectfully inform their friends" that they "continue to take Daguerreotype Portraits". William Hall and his wife Eliza were married for over 36 years and during their long marriage, Eliza gave birth to 8 children: Eliza Hall (born 1854), William Hall junior (born 1856), James Hall (born 1858), Christiana / Christina Hall (born 1859), Charles Hall (born 1862), John Hall (born 1864), Henry Hall (born 1866) and Kate Hall (born c1869). [ABOVE] William Hall and household members recorded at 13 St James's Street, Brighton in the 1861 census. In 1861, William Hall was the father of 4 children. By the time the next census was taken on 2nd April 1871, four more children had been added to the Hall family. As they grew older, William Hall's children assisted him in his photographic studio in West Street, Brighton. 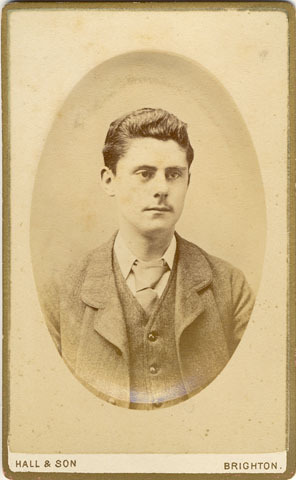 When the census was carried out on 3rd April 1881, twenty-four year old William Hall junior was working alongside his father as a photographer, his younger brother Charles Hall was recorded as a "Photographer's Assistant", aged 18, and fifteen year old Henry Hall was described as a "Photographer's Apprentice". 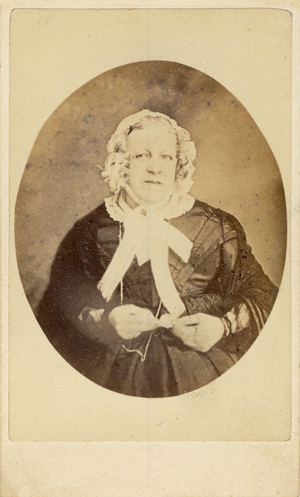 William's eldest daughter, Eliza Hall, was working as an "Artist" and might have been employed by her father to hand-colour his photographic portraits. 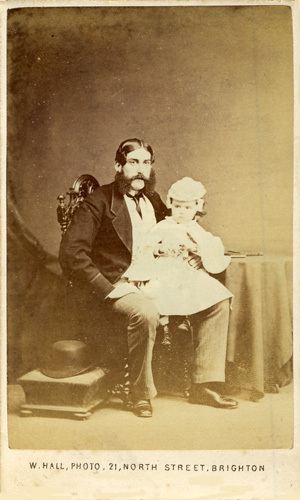 [ABOVE] A carte-de-visite portrait of a man with a child on his knee, photographed by William Hall of 21 North Street, Brighton (c1870). 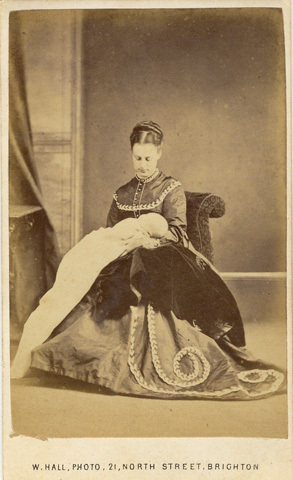 [ABOVE] A carte-de-visite portrait of a woman with a child at her side, photographed by William Hall of 21 North Street, Brighton (c1865). 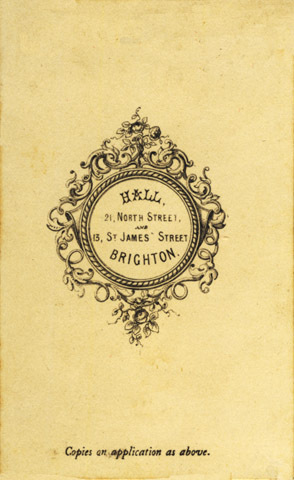 William Hall became the sole proprietor of the photographic portrait studio at 13 St James Street, Brighton at the end of November 1858. For a few years, William Hall was producing collodion positive portraits on glass and albumen prints on paper. 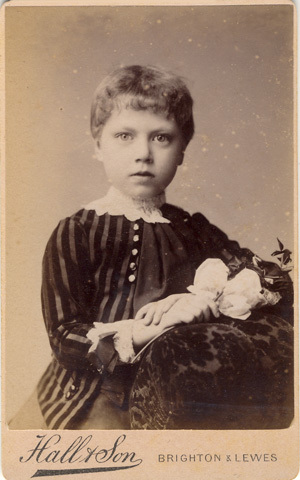 Hall's albumen paper prints were larger than his portraits on glass, probably measuring 6 inches by 8 inches. 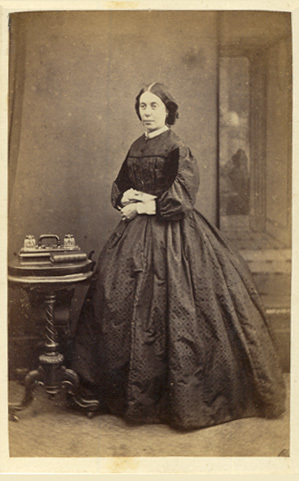 During the early 1860s, a recently introduced format for portrait photography known as the carte-de-visite became increasingly popular and supplanted the larger albumen prints. 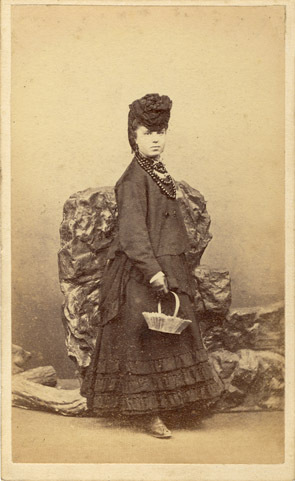 The carte-de-visite was a small photographic print pasted on a card measuring approximately 2 1/2 inches by 4 1/4 inches ( 6.3 cm by 10.5 cm), the same size as a conventional visiting card. A French invention, these small photographic portraits came to be known as cartes-de-visite (the French term for "visiting cards"). The great demand for carte-de-visite portraits led to an increase in the number of photographic portrait studios in Brighton. 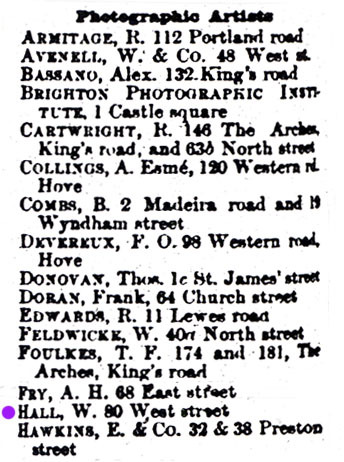 When Folthorp's General Directory of Brighton was published in 1862, eighteen studios were listed under the heading of "Photographic and Talbotype Artists". By the time Folthorp's directory of 1864 was published, William Hall's new premises at 21 North Street, Brighton, was one of nearly thirty photographic studios listed. Competition for business was fierce, driving down the price of carte-de-visite portraits. Early in 1862 William Hall was charging 12 shillings for a dozen carte-de-visite portraits. Stephen Grey, Hall's former business partner, charged one shilling for a single carte-de-visite portrait, but a dozen copies could be had for 5 shillings. A high class establishment, such as Mayall's Photographic Portrait Studio at 90-91 King's Road, Brighton, charged �1. 1s. for a set of 12 carte-de-visite portraits. In 1875, shortly after opening his photographic portrait studio at 80 West Street, Brighton, Hall advertised his new scale of prices. In 1875, William Hall charged one shilling for single copy of a carte-de-visite portrait, but he was now offering 6 copies for 4 shillings and 12 copies for 6 shillings. 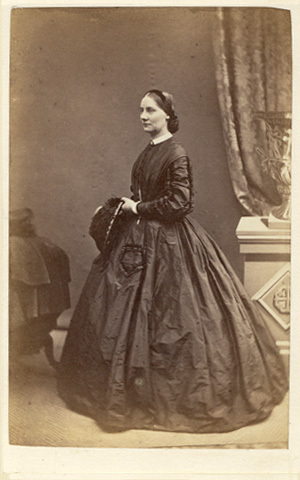 By 1871, William Hall had been in business in Brighton as a professional photographer for a period of 17 years. The 1871 census records William Hall as the owner of a photographic firm employing 9 workers (three men, four women, and two boys). At this time, in addition to his main photographic studio at 21 North Street, Brighton, William Hall was operating a photographic booth or kiosk on Brighton's West Pier. William Hall closed down his operations in North Street and the West Pier when he established a new photographic portrait studio at 80 West Street, Brighton, around 1874. [ABOVE] Photographic portrait studios operated by William Hall and his son between 1858 and 1899. [ABOVE] William Hall's scale of charges for carte-de-visite and cabinet portraits, as detailed on the reverse of a photograph produced at Hall's studio in West Street, Brighton around 1875. [ABOVE] The Brighton photographer William Hall and his family recorded in the 1871 census. 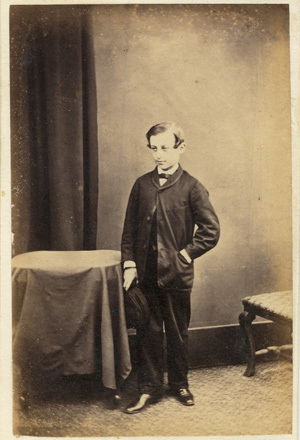 [ABOVE] A carte-de-visite portrait of an unknown boy, photographed by William Hall of 13 St. James' Street, Brighton (c1862). William Hall's trade plate appears beneath the portrait. 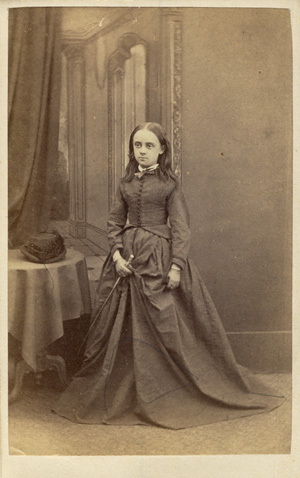 [ABOVE] A carte-de-visite portrait of an unknown girl, photographed by William Hall of 13 St. James' Street, Brighton (c1862). 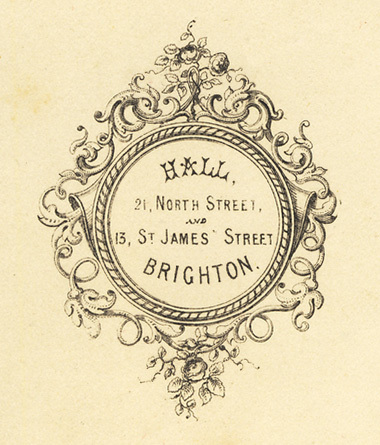 William Hall's studio details "W. Hall, 13 St James Street, Brighton" are printed on the reverse. 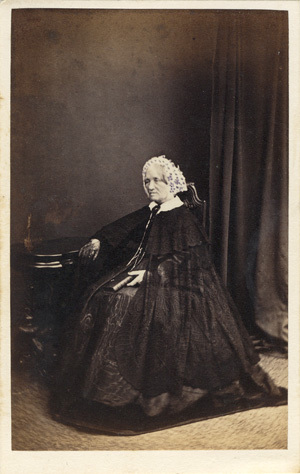 [ABOVE] A carte-de-visite portrait of Mrs Ann Maude Barrow (1790-1875), photographed by William Hall of 13 St. James' Street, Brighton (c1862). Ann Maude Boys had married Rev. Francis Barrow of Margate. 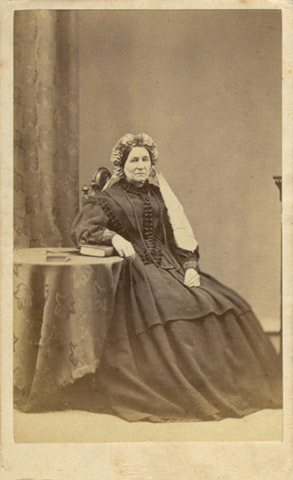 [ABOVE] A carte-de-visite portrait of a woman leaning on a chair, photographed by William Hall of 13 St. James' Street, Brighton (c1862). [ABOVE] A carte-de-visite portrait of a young couple, photographed by William Hall of 13 St. James' Street, Brighton (c1862). 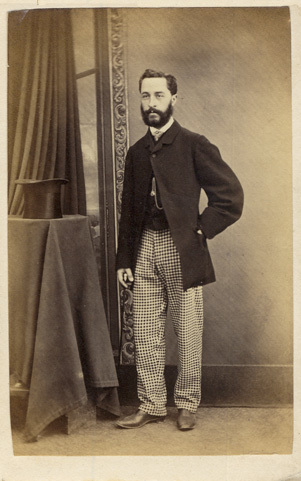 [ABOVE] A carte-de-visite portrait of a bearded man in check trousers, photographed by William Hall of 13 St. James' Street, Brighton (c1862). [ABOVE] A carte-de-visite portrait of a woman holding a letter, photographed by William Hall of 13 St. James' Street, Brighton (c1862). [ABOVE] A carte-de-visite portrait of a woman holding a hat, photographed by William Hall of 13 St. James' Street, Brighton (c1862). [ABOVE] An advertisement for William Hall's carte-de-visite portraits of eminent church ministers. (The Brighton Gazette, Thursday, 27th February 1862). William Hall of 13 St. James' Street, Brighton, produced a number of portraits depicting well-known clergymen, generally regarded as celebrities in Victorian times. Achieving recognition for their preaching and good works, church ministers were regarded as "local celebrities" and their photographic likenesses were collected alongside other notable figures such as artists and politicians. 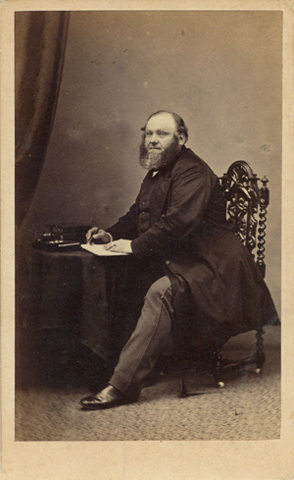 [ABOVE] Reverend James Vaughan (born c1805), the Perpetual Curate of Christ Church, Montpelier Road, Brighton, a carte-de-visite by William Hall of 13 St. James' Street, Brighton and 21 North Street, Brighton (c1863). Reverend Vaughan was famous for his sermons. [ABOVE] A carte-de-visite portrait of a seated man, possibly a church minister, photographed by William Hall of 13 St. James' Street, Brighton and 21 North Street, Brighton (c1863). Hall produced a series of portraits depicting eminent church ministers. In addition to having their own portrait taken in carte-de-visite format, some inhabitants of Brighton would collect cartes which featured portraits of national figures or local celebrities. 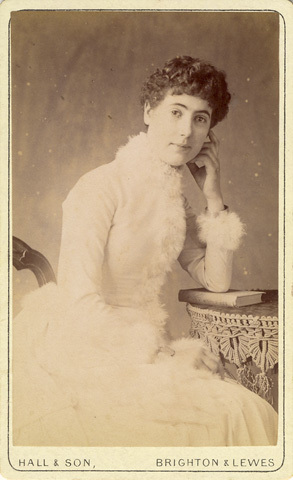 Bookshops, stationers and art repositories would stock photographic portraits of famous men and women (novelists, artists, politicians, singers, actors and actresses, etc.). 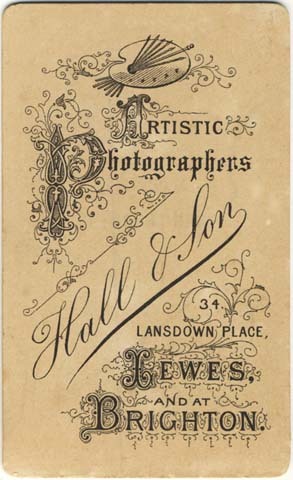 William Hall was one of the first photographers in Brighton to promote "celebrity cartes". In a newspaper advertisement dated 27th February 1862, William Hall offered to the public carte-de-visite portraits of "Eminent Ministers - taken from life". In his advertisement, Hall listed 20 church ministers who were depicted in his carte-de-visite portraits, including the Reverend T. Trocke of Chapel Royal and Reverend J. L. Knowles of St Peter's Church. Around 1874, William Hall was selling signed portraits of 'Captain' Frederick Collins, the proprietor of the Brighton pleasure yacht the "Skylark". 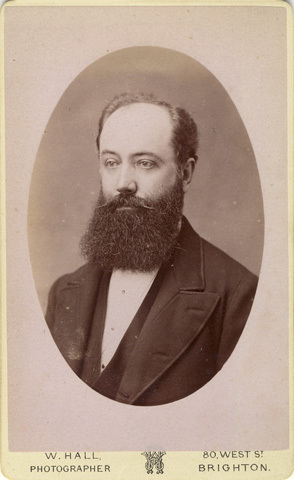 William Hall was also known to photograph oil paintings and other works of art and sell the reproductions in the form of cartes-de-visite and cabinet cards. 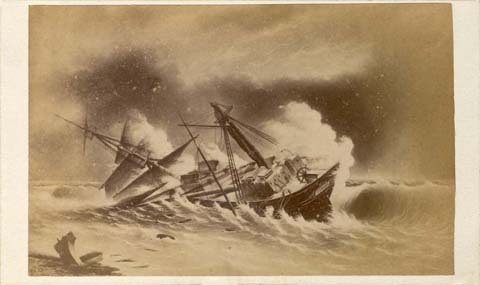 In 1877, William Hall produced a carte-de-visite which carried a photographic reproduction of a painting depicting the wreck of the Ida, a barque from Glasgow which got into trouble off the coast of Brighton at the beginning of that year. [ABOVE] A painting entitled 'Wreck of the Ida, January 6th, 1877', photographed by William Hall of Brighton and issued as a carte-de-visite. Wrecked off the coast of Brighton, the Ida was sailing from France. All 14 crew were rescued by Brighton lifeboats. [ABOVE] 'Captain' Frederick Collins (1832-1912), the proprietor of the pleasure yacht the "Skylark", a carte-de-visite photograph by William Hall of 80 West Street, Brighton (c1874). The photograph is signed "Yours truly, Fred Collins, Skylark". Frederick Collins was a well-known figure in Brighton and something of a local celebrity. William Hall also sold portraits of eminent church ministers from the local area who were regarded as "celebrities". [ABOVE] A carte-de-visite portrait of an unknown clergyman photographed by William Hall of 21 North Street, Brighton (c1864). This portrait was probably part of William Hall's series "Portraits of Eminent Ministers, taken from life", which he produced during the early 1860s. In an advertisement placed in The Brighton Gazette on Thursday, 27th February 1862, William Hall listed nearly two dozen clergymen "of all denominations" who had sat for him at his Brighton studio. The photographic portraits were published as "celebrity cartes" and sold in Brighton bookshops, etc. 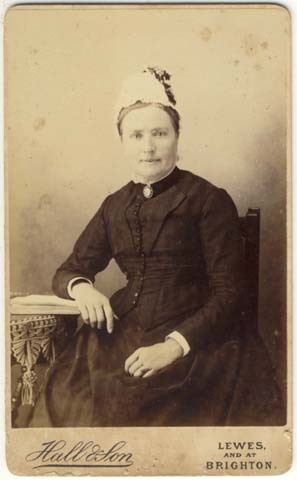 [ABOVE] A carte-de-visite portrait of a middle-aged woman sitting at a table with her arm resting on a book, photographed by William Hall either at 21 North Street, Brighton or 13 St James's Street, Brighton (c1863). [ABOVE] The trade plate of the photographer William Hall which appeared on the reverse of the carte-de-visite illustrated on the left (c1863). At this time William Hall was operating from 13 St. James's Street and 21 North Street, Brighton. 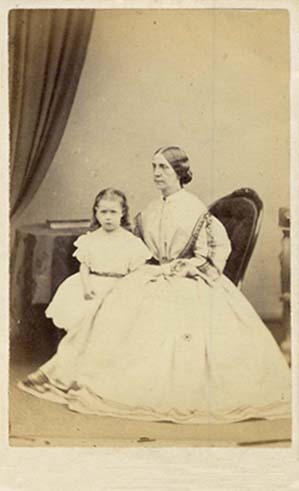 [ABOVE] A carte-de-visite portrait of twenty-one year old Mrs Phoebe Cresswell (born 1847) and her baby daughter Phoebe Emily Cresswell (born 1868, Brighton) photographed by William Hall of 21 North Street, Brighton (c1868). [ABOVE] A carte-de-visite portrait of teenage girl standing at an elaborately decorated writing desk, photographed by William Hall of 21 North Street, Brighton (c1870). 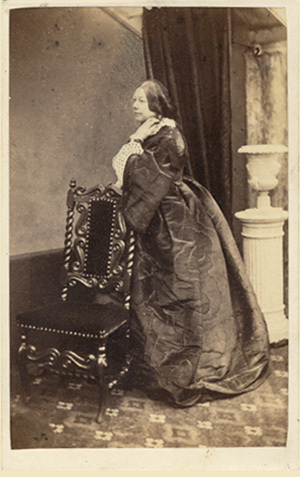 [ABOVE] A carte-de-visite portrait of a middle-aged woman standing by a padded chair, photographed by William Hall of 21 North Street, Brighton (c1868). The reverse of the carte is blank, the photographer's details being printed at the foot of portrait. 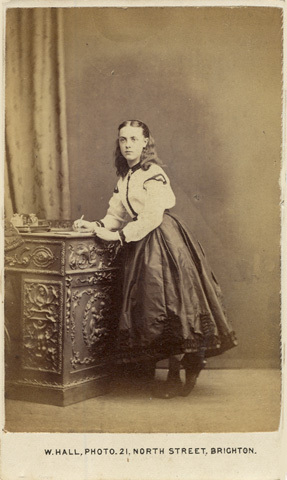 [ABOVE] A carte-de-visite portrait of teenage girl posed between a chair and a writing desk, photographed by William Hall of 21 North Street, Brighton (c1864). The trade plate on the reverse of the carte is of the same design as above but states "Late of St. James Street". [ABOVE] The trade plate of William Hall, photographer of 21 North Street, Brighton (c1865). 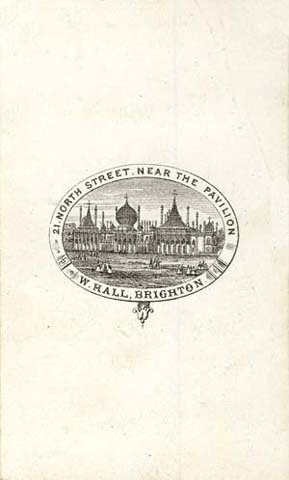 The trade plate employs an engraving of the Royal Pavilion which was situated a short distance from Hall's studio on the other side of North Street. 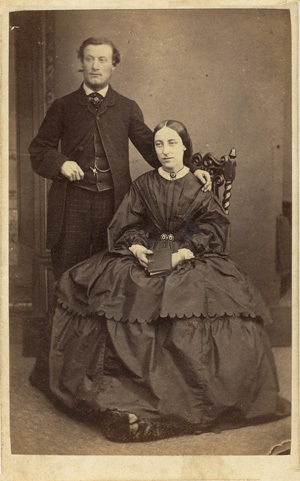 [ABOVE] A carte-de-visite portrait of a young couple, photographed by William Hall of 21 North Street, Brighton (c1865). On the reverse of this photograph is a printed trade plate incorporating a printed view of the Royal Pavilion. (See the illustration on the left). The Diamond Cameo Portrait was introduced by the photographer Frederick Richard Window (1824-1875) of the London photographic firm of Window & Bridge in 1864. [The patent of the Diamond Cameo design was registered by F. R. Window of Window & Bridge in July 1864]. The Diamond Cameo consisted of four small oval portraits arranged in the shape of a diamond on a carte-de-visite, each portrait showing the subject's face in a different position. Once the small photographic portraits were pasted on the diamond template on the cdv mount, a specially designed press was used to punch the portraits into a convex shape which resembled a cameo. (See the examples of William Hall's Cameo Portraits below). A special multi-portrait camera manufactured by J. H. Dallmeyer of London was used to capture the four small portraits on a single glass negative. To produce four good portraits in different positions at a single setting was a difficult process and relatively few studios produced Diamond Cameo Portraits. In Brighton, William Hall of 21 North Street and Hennah & Kent of 108 King's Road were two studios which produced Diamond Cameo Portraits. [ABOVE] The trade plate of William Hall, photographer of 21 North Street, Brighton, which features Window & Bridge's registered trade mark for the Diamond Cameo Portrait (c1865). [ABOVE] A Diamond Cameo Portrait of a young woman, produced by William Hall of 21 North Street, Brighton (c1866). 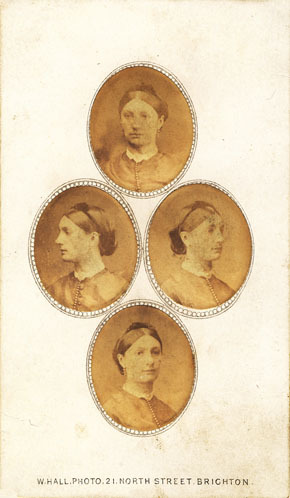 All four of the small portraits have been punched out into a convex-shape. [ABOVE] A Diamond Cameo Portrait of a young woman, produced by William Hall of 21 North Street, Brighton (c1865). On the reverse of this carte-de-visite is Window & Bridge's registered trade mark for the Diamond Cameo Portrait [ABOVE] A Diamond Cameo Portrait of a young man, produced by William Hall of 21 North Street, Brighton (c1865). On the reverse of this carte-de-visite is Window & Bridge's registered trade mark for the Diamond Cameo Portrait [ABOVE] A Diamond Cameo Portrait of a young man, produced by William Hall of 21 North Street, Brighton (c1867). All four of the small portraits have been punched out into a convex-shape. The West Pier was constructed on Brighton's seafront between 1864 and 1866. The West Pier was opened to the public on 6th October,1866. At the beginning, there was an admission charge of 2d (two old pence), reduced to one penny on Sunday. The price of admission was collected at two large, square-shaped toll houses situated at the entrance to the Pier. These two toll houses were large enough to accommodate shops which sold gifts, sweets and souvenirs to those that visited the Pier. 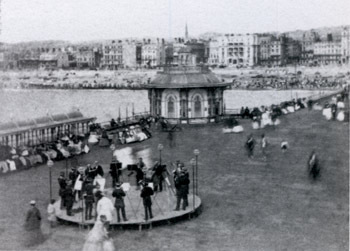 On the pier itself there were six ornamental kiosks which contained toy and fancy goods bazaars, refreshment rooms, etc. There was also an open bandstand at the pier head. 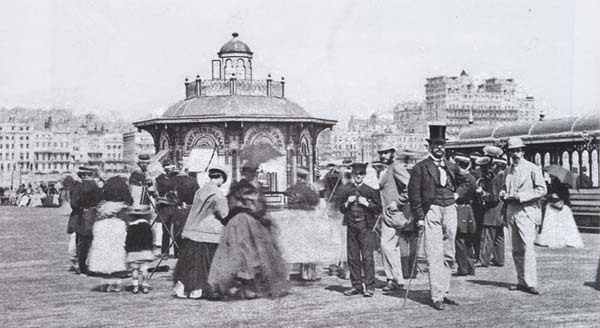 Between 1870 and 1873, William Hall was operating a photographic booth on the West Pier as well as a well-equipped photographic studio at 21 North Street, Brighton. It is not clear where William Hall stationed his camera on the West Pier, but I assume Hall or one of his employees operated from one of the six ornamental kiosks on the pier's promenade or was based in one of the toll houses at the entrance. The carte-de-visite portraits produced at Hall's West Pier booth are distinct from the formal portraits taken at Hall's main photographic studio in North Street. Whereas the portraits taken in Hall's North Street premises contain the usual studio props - furniture, drapes, books, painted backcloth, etc., his West Pier portraits are more stark with plain backgrounds with only a collection of fake rocks and boulders to suggest a seaside setting. For the select and fashionable visitors who had paid an entrance fee to promenade along the 1,115 feet long pier, Hall's photographic booth might have seemed a novelty, but probably did not appeal to their sophisticated taste. It is possibly significant that the few examples of Hall's West Pier portraits in my own collection feature teenagers and young women. If the West Pier was not so exclusive in the early 1870s and was free to all, Hall's photo booth might have attracted more customers. William Hall closed his West Pier studio after a couple of years. Hall was succeeded on the West Pier in 1873 by the photographer Robert James Parnell (born 1841, St Pancras, London), but he too struggled for custom and he was gone within the year. It would be another 20 years before another photographer based himself on Brighton's West Pier. [The German photographer William H. Schwartz (born c1868, France) operated a studio on the West Pier between 1895 and 1915]. [ABOVE] The Head of the West Pier showing the open bandstand and one of the 4 ornamental kiosks at the Pier Head (c1870). The photographer William Hall probably operated from one of the kiosks on Brighton's West Pier. [ABOVE] The trade plate used by the photographer William Hall during the time he or his camera operators were producing photographic portraits on Brighton's West Pier. [ABOVE] Holidaymakers on Brighton's West Pier listening to the Pier Band (c1870). The West Pier was opened to the public on 6th October 1866. From the very beginning, visitors to the West Pier had to pay an admission toll to gain access to the pier's promenade. 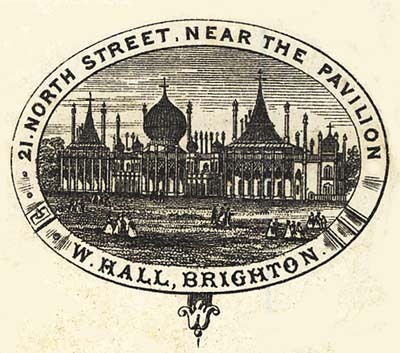 The ornamental kiosk carries a shop sign which reads "West Pier Bazaar - Admission Free". 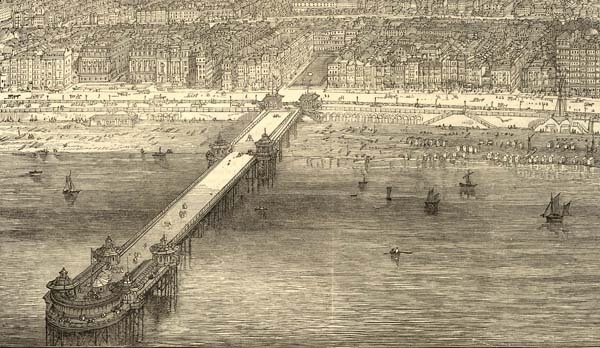 [ABOVE] A Bird's Eye View of the West Pier, part of a panoramic view of Brighton's seafront, published in the Illustrated London News in August 1872. William Hall or, more likely, one of his operators, took photographic portraits on Brighton's West Pier between 1870 and 1873. Presumably, William Hall's photographic studio was situated either in one of the large toll houses at the entrance to the West Pier or in one of the six ornamental kiosks on the Pier itself. 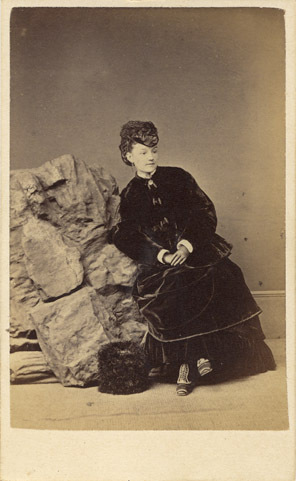 [ABOVE] A carte-de-visite portrait of a young woman posing in front of a group of rocks, a studio prop which suggested the seaside at William Hall's studio on Brighton's West Pier (c1871). [ABOVE] A young woman leaning against a collection of rocks at William Hall's studio on Brighton's West Pier (c1871). The rocks, which were probably made from papier-mache or similar material, evoked the seaside. [ABOVE] The trade plate which appeared on the reverse of the carte-de-visite illustrated on the left. William Hall gives details of his main studio at 21 North Street, Brighton as well as his modest studio booth on Brighton's West Pier. 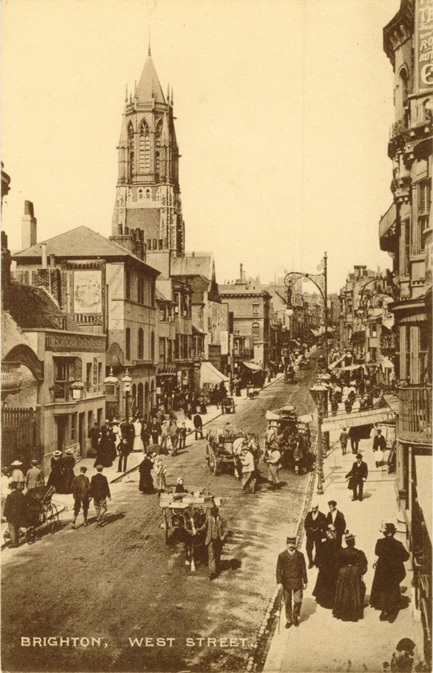 [ABOVE] West Street, Brighton, looking north from the seafront, photographed in the late 1880s from the junction with South Street and King's Road.. The entrance to the studio of William Hall & Son at 80 West Street (marked by a striped awning carrying the words "W. HALL & SON, PHOTOGRAPHERS") can be seen on the eastern side of the road, immediately below the painted wall sign for the Grand Skating Rink (No.78) and immediately to the left of Chatfield's Hotel (No. 81 West Street). 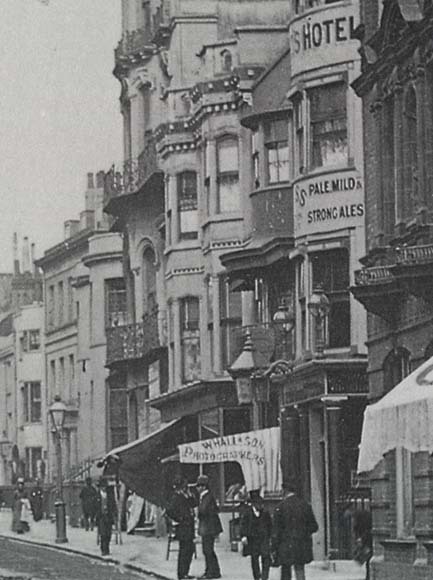 [ABOVE] Detail of the photograph of West Street, Brighton, illustrated on the left, showing the entrance to the studio of William Hall & Son (marked by a striped awning carrying the words "W. HALL & SON, PHOTOGRAPHERS". To the right of Hall's studio is Chatfield's Hotel (No. 81 West Street). 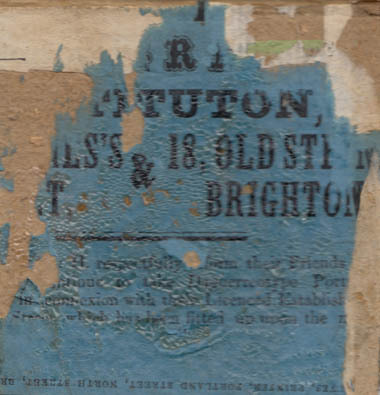 [ABOVE] A detail from a late Victorian map of Brighton showing the location of the photographic businesses operated by William Hall between 1864 and 1898. William Hall opened his studio at 21 North Street [marked on the map by a red dot] around 1863 and continued at this address until 1874. For a brief period in the early 1870s (1870-1873), William Hall's operators also took photographic portraits on Brighton's West Pier [marked by a blue dot]. 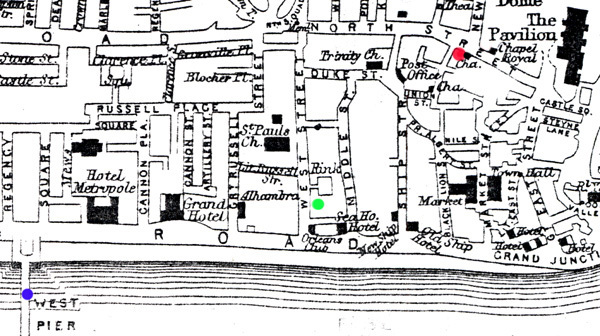 Around 1875, William Hall opened a new studio at 80 West Street [marked on the map by a green dot]. Hall's new studio at 80 West Street was situated at the bottom of West Street, between the Grand Concert Hall & Skating Rink and South Street and, in the words of the photographer, was only "3 Doors from the King's Road". 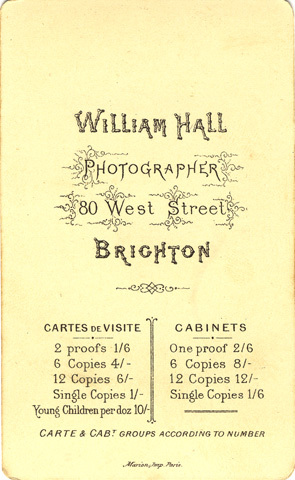 William Hall opened a photographic portrait studio at 80 West Street, Brighton, in 1874 or 1875. William Hall's new studio was situated on the eastern side of the road at the foot of West Street, only "3 Doors from the King's Road". 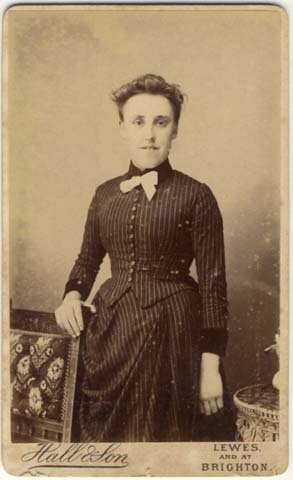 At his new studio in Brighton's West Street, William Hall produced portraits in the two most popular photographic formats - the carte-de-visite ( small portrait photographs which measured roughly 4 inches by 2 1/2 inches) and the larger cabinet portrait - a photographic print mounted on a sturdy card measuring 41/4 inches by 61/2 inches (roughly 11cm x 17cm). 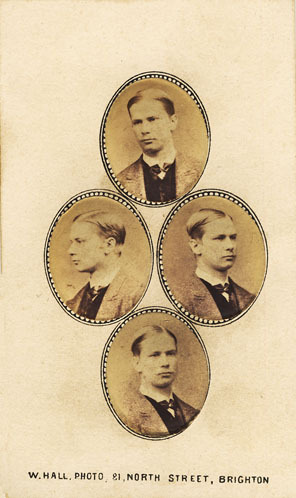 William Hall's scale of charges for carte-de-visite and cabinet portraits were printed on the reverse of some of the card mounts produced around 1875. 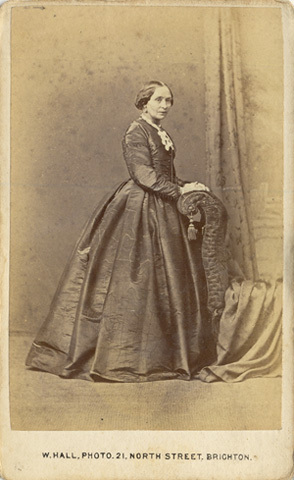 For two proof copies of the original carte-de-visite photograph, Hall charged 1s 6d. If the customer only wanted a single carte-de-visite portrait, he or she would have to pay 1 shilling. The customer could order further copies at a reduced rate. Hall charged 4 shillings for 6 copies of a carte-de-visite (cdv) portrait, while 12 copies of a cdv could obtained for 6 shillings. Photographic portraits of infant children or babies would cost extra. Carte-de-visite portraits of young children were priced at 10 shillings a dozen. Hall also charged extra for group photographs. A single cabinet portrait could be purchased for 1s 6d. 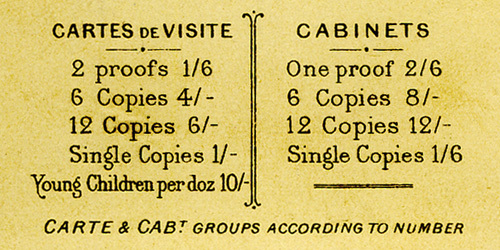 A half-dozen copies of a cabinet portrait would cost 8 shillings. A dozen cabinet portraits could be obtained for 12 shillings*. * A note on prices and relative values. In 1867, the statistician Leone Levi reported that the average weekly wage for adult males in England and Wales was 22s 6d. Levi went on to point out that the average weekly wage for women in England was 12s 6d. A report on the wages of clerical workers in 1871 noted that junior clerks aged between 18 and 20 received about 28 shillings a week. A house maid would have been paid an annual salary of around �18 (approximately 7 shillings a week). [ABOVE] West Street, Brighton, looking north, photographed around 1905. By this date William Hall's studio at 80 West Street had closed and had been absorbed by Chatfield's Hotel (the building on the extreme right, immediately before the advertising banner which juts out above the pavement). The projected sign reads "ANIMATED PHOTOGRAPHS", and marks the entrance to The Grand Concert Hall which showed moving pictures even before its conversion into the Grand Picture Palace in 1911. On the other side of the road stands the tower of St Paul's Parish Church. [ABOVE] The Brighton photographer William Hall and his family recorded in the 1881 census. In 1881, three of William Hall's children were assisting him in his photographic studio. Hall's eldest son, William Hall junior, also a photographer, was lodging with a coach builder named William Jordan at a house in Brighton's Kemp Town. 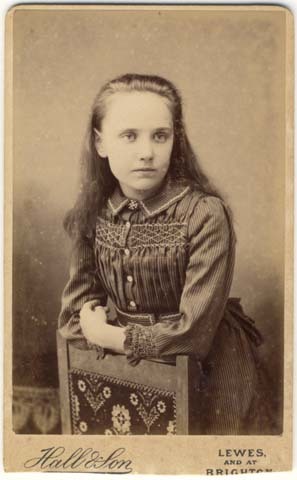 [ABOVE] A young woman leaning on an occasional table, photographed at William Hall's studio at 80 West Street, Brighton (c1875). 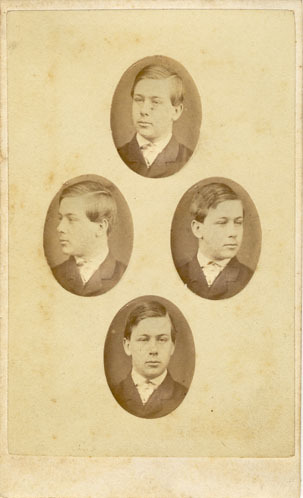 [ABOVE] William Hall's scale of charges for carte-de-visite and cabinet portraits, as printed on the reverse of a carte-de-visite produced around 1875 at Hall's studio in Brighton's West Street. 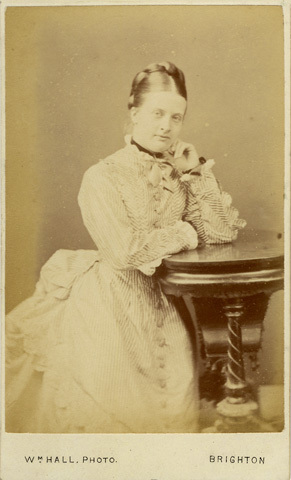 [ABOVE] One of a pair of carte-de-visite portraits produced around 1878 at William Hall's studio at 80 West Street, Brighton. 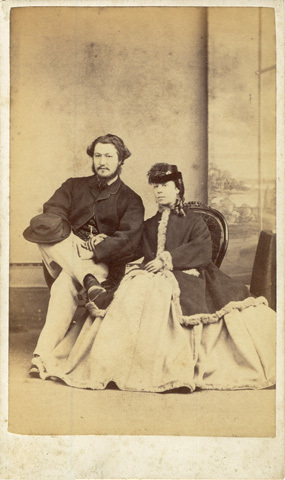 This portrait of a woman is a companion piece to the cdv of the bearded man (right) [ABOVE] A carte-de-visite portrait of a heavily bearded man, presumably the husband of the lady pictured on the left. Both portraits were produced around 1878 at William Hall's studio at 80 West Street, Brighton. [ABOVE] A carte-de-visite portrait of a young woman holding a document, photographed by Hall & Son of 80 West Street, Brighton (c1886). 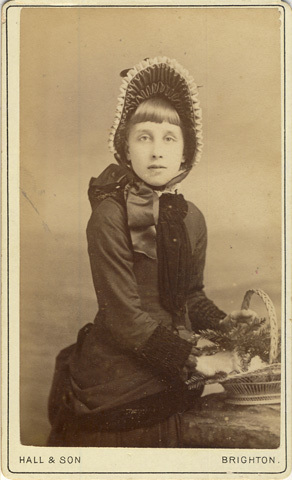 [ABOVE] A carte-de-visite portrait of a girl wearing a bonnet and holding a flower basket photographed by Hall & Son of 80 West Street, Brighton (c1886). 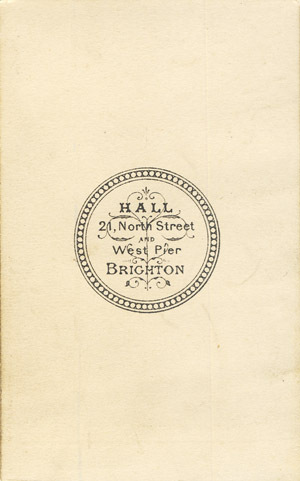 [ABOVE] The trade plate of Hall & Son, photographers of 80 West Street, Brighton (c1886). [ABOVE] A carte-de-visite portrait of a young man in an oval frame, photographed by Hall & Son of 80 West Street, Brighton (c1888). [ABOVE] The studio premises at 34 Lansdown Place, Lewes, which was situated next to the Lansdown Arms public house and was occupied by the photography firm of William Hall & Son for a few years between 1886 and 1890. When this photograph was taken around 1910 the business went under the name of A. M. Bliss & Co. After operating as a professional photographer in Brighton for over 30 years, William Hall opened a branch studio in Lewes around 1887. William Hall sold his studio at 34 Lansdown Place to Alfred March Bliss in 1890. Around 1886, William Hall brought his son William Hall junior (born 1856, Brighton) into his photography business. Shortly after the partnership between father and son was formed, a branch studio was opened in Lewes. 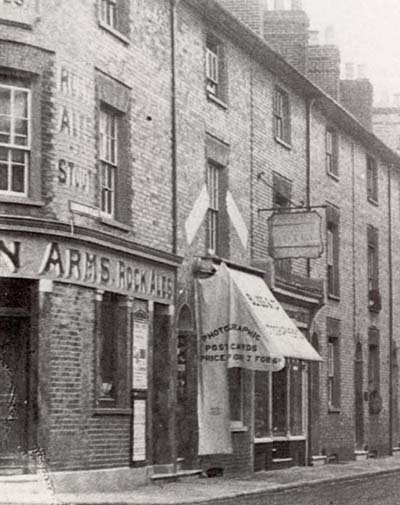 The studio premises of Hall & Son at 34 Lansdown Place, Lewes, was next door to the Lansdown Arms public house at the junction of Station Street and Station Road and therefore close to Lewes Railway Station. 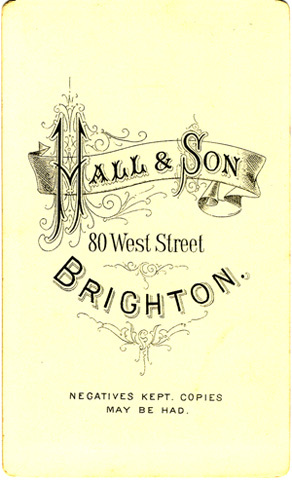 It is likely that the Lewes branch of Hall & Son was managed by William Hall junior, William Hall's eldest son. William Hall junior was born in Brighton towards the end of 1856 and appears to have assisted his father in his Brighton studio as a teenager. By 1881, William Hall junior was working as a professional photographer in Brighton. The carte-de-visite and cabinet portraits produced at 34 Lansdown Place, Lewes, generally carry the Lewes address and, at the foot of the photograph, the printed words "LEWES and at BRIGHTON". 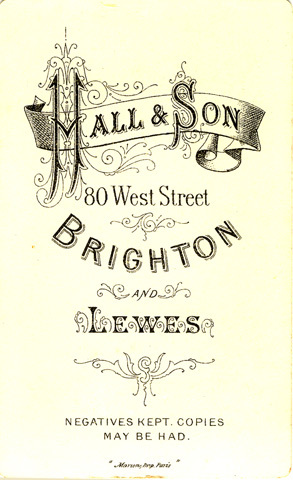 In 1890, after 3 or 4 years in Lewes, the firm of Hall & Son sold their studio at 34 Lansdown Place, Lewes, to Alfred March Bliss (born 1861, Cardiff, Wales). [LEFT] The trade plate used by William Hall & Son on the reverse of the photographs produced at their branch studio at 34 Lansdown Place, Lewes. 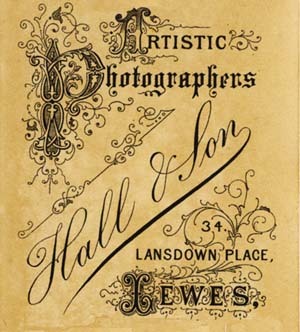 The Brighton photographer William Hall opened a branch studio in Lewes around the time his son was brought into the business. 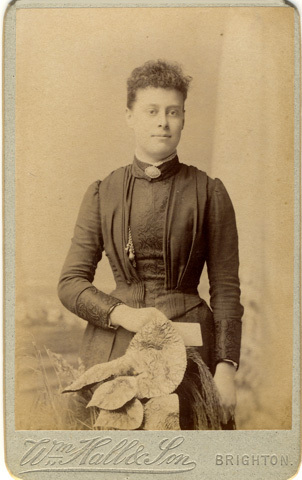 [ABOVE] A carte-de-visite portrait of a woman holding a book, photographed by Hall & Son of 80 West Street, Brighton and Lewes (c1888). 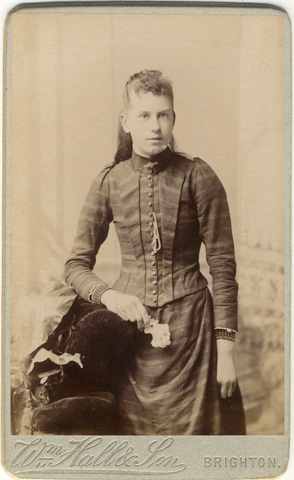 [ABOVE] A carte-de-visite portrait of a young woman leaning on a table, photographed by Hall & Son of 80 West Street, Brighton and Lewes (c1888). [ABOVE] The trade plate of Hall & Son, photographers of 80 West Street, Brighton and Lewes taken from the reverse of a carte-de-visite portrait (c1888). [ABOVE] A carte-de-visite portrait of a young girl holding an artificial flower, photographed by Hall & Son of 80 West Street, Brighton and Lewes (c1890). [ABOVE] A carte-de-visite portrait of a teenage girl standing by padded chair, photographed at the studio of William Hall & Son, 80 West Street, Brighton (c1890). 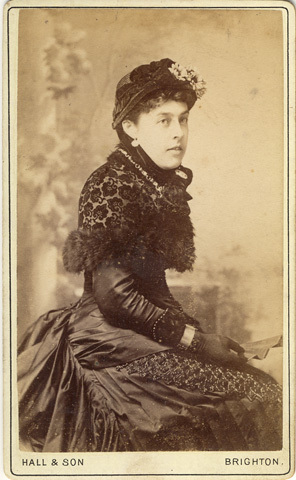 [ABOVE] A carte-de-visite portrait of a young woman standing behind a plant, photographed at the studio of William Hall & Son, 80 West Street, Brighton (c1890). [ABOVE] A carte-de-visite portrait of a middle-aged woman, photographed at the studio of William Hall, 80 West Street, Brighton (c1898). 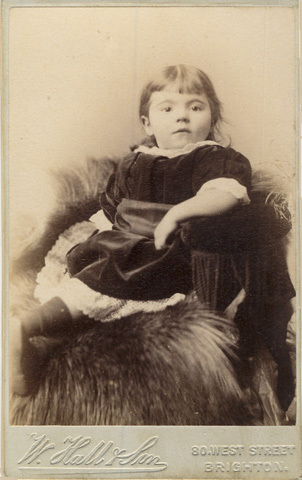 [ABOVE] A carte-de-visite portrait of a young child sitting on an animal fur, photographed at the studio of William Hall & Son, 80 West Street, Brighton (c1897). When the 1891 census was taken, William Hall was living with his wife and two unmarried daughters in quarters attached to his studio at 80 West Street, Brighton. On the census return, William Hall is described as an "Artist & Photographer", aged 65. 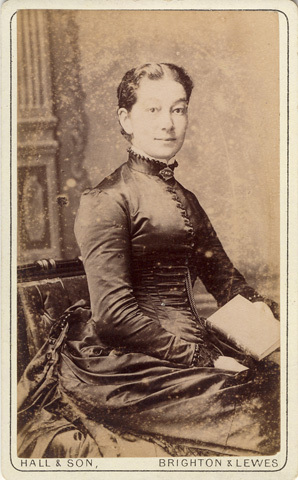 William Hall's eldest daughter, thirty-six year old Eliza Hall, gives her occupation as "Artist Photographer". William's other daughter, Christina Hall is recorded on the census return as a "Photographer's Assistant", aged 31. The photographic studio at 80 West Street, Brighton, continued under the name of "William Hall" until around 1898. 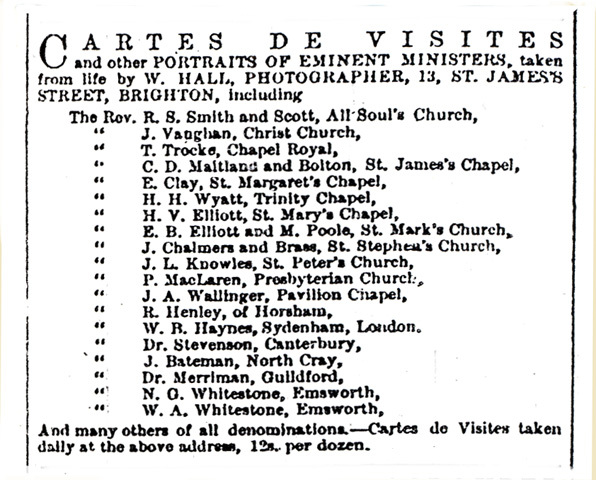 William Hall is last listed as a professional photographer in Brighton in the 1898 edition of Towner's Directory of Brighton. (In 1898, William Hall would have been 72 years old). William Hall set himself up as a professional photographer in Brighton in 1854 and he was still listed as a professional photographer in Brighton some 44 years later, making Hall one of the longest serving photographers in Brighton's history. Towards the end of 1881, William Hall junior, William Hall's son, married Kate Peirce (born 1857, Brighton). By the time the census was taken on 31st March 1901, William Hall junior was working as a "Photographer" in Fulham. William Hall junior was not the proprietor of a studio in 1901 and on the census return he makes it clear that he was an employed photographer, giving his status as "Worker". In 1901, William Hall was living with his wife, Kate, at 65 Radipole Road, Fulham. When the next census was taken 10 years later, William Hall junior's situation had changed in only one respect. William Hall, now 54 years of age, was still living at 65 Radipole Road, Fulham and still gave his occupation as "Photographer (worker)", however, Hall and his wife were now parents of a 9 year old boy, Maurice Walter Hall. [ABOVE] The photographer William Hall recorded in two Brighton trade directories issued 36 years apart. On the left, William Hall listed as a Photographic Artist in the 1862 edition of Folthorp's Brighton Directory. On the right, the last entry of William Hall as a professional photographer as printed in Towner's Directory of Brighton published in 1898. William Hall's photographic career in Brighton spanned 44 years and he is the only photographer to appeared in both the 1862 and 1898 list of Brighton photographers.